Released last May, Nathan Johnson blew minds with the painstaking creativity of his push pin rotoscoped stop motion music video for Son Lux track Change is Everything. Ahead of the film’s well deserved screening at next month’s SXSW film festival, Nathan invited DN to dig into the hazards of flying pins and sore fingers he and co-animator Katie Chastain faced during the creation of this mind-boggling geometric animation. My first question has to be, what the hell were you thinking? 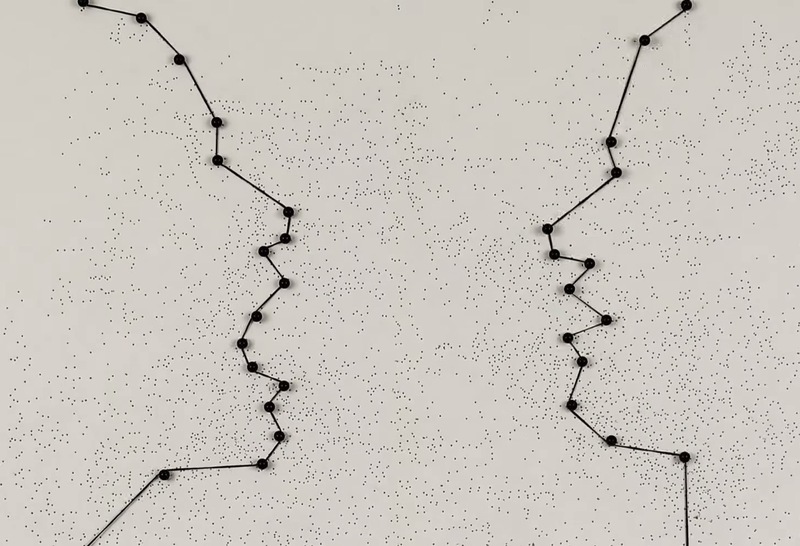 How did the idea of a push pin thread animation coalesce into this film? I think it’s clear that we weren’t thinking very clearly at all. My brothers and I talk a lot about the idea of doing things “the long, hard, stupid way,” and this project definitely falls into that category. Son Lux had talked to us about doing a few videos and I was basically just trying to think of a concept that could be done in a simple way… Something that my wife, Katie, and I could do fairly quickly at home in our studio. I mean, it is a fairly simple idea in a conceptual way, but it’s safe to say that all of my estimates on the amount of time it would take were way off. It ended up being a lot longer, harder, and stupider than we imagined. Did anyone loose an eye whilst making this? Almost, but thanks to Katie, all four of our eyes are still intact. Alongside directing projects you’ve also scored some of my favourite features such as Brick, The Brothers Bloom and Looper. How did you get your start in film scoring and what prompted you to augment your composing career with music video direction? Thank you very much! The answer to all of those things really goes back to the how we grew up. I have a huge extended family, and as kids, we spent all our free time making movies and music together. It was a whole lot of songwriting and moviemaking and stunt shows with all the siblings and cousins. That sort of just continued into adulthood. I was in a band with a bunch of my siblings, and when my cousin Rian was making Brick, he asked if I would be up for doing the score. Film just seems to be the culmination of a lot of my favorite things: music, theater, collaboration, graphic design, building stuff. I think that when you’re making things as a kid, everything just kind of gets mixed together. You’re not necessarily thinking about roles or job titles; you’re just making things that interest you. Thankfully, we’ve been able to continue a lot of that approach as we’ve grown older. I love the idea of seeing something ordinary and mundane transformed into something beautiful and lifelike. The physicality of utilising field recordings and non-instruments is a key element in your composition work, did that approach nudge you towards the labour intensive nature of this video concept? Absolutely. That thing you’re talking about is a real through-line in my process. I’ve always been attracted to conceptual art that uses very simple materials in its execution and I love the “lots of something little” approach… I guess, partly, because it means that you can use everyday materials that everybody has access to, which feels really accomplishable. I love the idea of seeing something ordinary and mundane transformed into something beautiful and lifelike, whether that’s using cheese graters and wine glasses as musical instruments or hundreds of push pins as animated nodes. I think in all of these cases, it feels really empowering to know that once you’ve got an idea, the price of admission is only the amount of time and energy you’ve got to spend. Your relationship Son Lux goes back quite a while, how did those musical collaborations develop into visual collaborations? Yeah, Ryan Lott and I have been close friends and tight collaborators for such a long time. A big part of what comes out of a deep relationship like that is trust… namely the trust that allows you to understand each other and all the ways your strengths and weaknesses can enhance each other. We started out doing a lot of musical collaborations, but it grew beyond that fairly quickly. I think he had been a fan of what my brother Marke and I were doing at The Made Shop, so he asked us to design the cover artwork for We Are Rising. Last year, as the band was writing the new album, they approached us with the idea of having us oversee all the different visual elements. They actually talked about the idea of us being a part of the band, almost as visual members, which was really a cool way to think about it, and a real honor for us. It’s so crucial for me to love the projects I choose to work on, because that love acts as a generative flame that really keeps me fresh and excited. Needless to say, I’m a huge fan of Son Lux, and that excitement was really helpful during some of the painfully long animation days. What were the production steps you took to achieve and ease the pain of animating Change is Everything? We did as much as we could ahead of time, although I keep finding out about tools that would have been lifesavers had I known about them before. I only just realized that they make software specifically for stop-motion animation. So, you know… that would have been helpful. But yeah, my plan was to do a physical rotoscope, so I cut a whole reference video together ahead of time. My brother Marke has a background in architecture, so we modelled the spinning geometry in Sketch-Up, and then I burned in the frame numbers and projected the video frame-by-frame onto our work surface. I knew it was going to be important to have a map to follow, so we essentially “projector-rotoscoped” the entire thing. Just mind numbing days and days of moving pins half a millimeter at a time to trace our map projections. Change is Everything opens with you placing the initial pins and thread on the board, was that prompted by a concern that audiences would presume this was a digital rather than physical piece? Yes! We showed an early version to some friends and a guy in the other room looked over and said “oh cool, did you use a computer to animate that?” I was mortified. I mean, let’s be honest, if it’s made with a computer, it’s basically the dumbest animation ever. The material was such an important part of the whole thing, so we added the little intro, and we also re-graded the whole thing so it wasn’t as crunched and you could really see all the physicality of it. Let’s be honest, if it’s made with a computer, it’s basically the dumbest animation ever. The animation is augmented by these smooth, fluid camera moves, where those achieved live or in post? Part of the benefit of shooting stop motion still frames was that we had these huge files, so we were able to punch in after the fact and still have way more resolution than we needed. Once Katie and I finished the physical animation, my brother brought it into After Effects and suggested a few camera moves, which I ended up really loving. It feels really nice to get even closer to the surface, feeling the holes and the imperfections in everything. I don’t think we did any cleanup, aside from the final grade. The film feels increasingly tactile as the boards become more perforated. What was the balance between practicality and aesthetics when it came to resetting the boards and shifting between light and dark? Originally, I wanted it to all happen on one board, but again, that was one of the things that we couldn’t figure out until we tried it. By the time we made it to the cityscape after the first chorus (around 1:25), there were so many holes in the center of the board that there was nothing left to stick the pins into. They were popping out and flying all over the studio, so at that point my wife (and fellow animator) instituted the safety goggles rule. We just looked for good breaks when we needed to switch to a fresh board. I had it in the back of my mind that I might want to change over to the dark boards at some point, but I’m pretty sure that wasn’t defined when we started. Part of the decision had to do with how great the white pins and thread looked against the black, and in the end, I felt like it would be a welcome break. Some of the more complex sections clearly required a huge number of pin moves, where there any conceived scenes you had to jettisoned as too burdensome? The entire TV/face zoom-out was terrible. It involved 50-60 nodes, which was a lot to begin with, but because we were doing an implied zoom (i.e., not a camera move), each frame required us to slightly move every single pin on the board in order to create the feeling that the picture was shrinking. I had thought we’d be able to shoot a new frame every 2 minutes, but these big frames were hitting like 30 or 40 minutes. After that, I tried to minimize any complex, full-board moves, and we left the final zoom into the clock as a job for post. Change is Everything was released back in May last year, what have you been working on in the meantime and what will we get to see/hear from you next? Quite a bit of music recently and a handful of videos I’m in the middle of editing right now. One of my favorite things we did last year was the other Son Lux video with Tatiana Maslany, who is just my favorite. So much fun to work with her and Noah Segan, who is a dear friend and basically part of the family as well. Currently, I’m just finishing up a new video for Lucius which should be out very soon. Words are one thing but as they say seeing is believing so here’s the Change is Everything making of video to put all of Nathan’s answers into context.